Our Tandem Bicycle Weather Vane was commissioned by a cycling couple who wanted to commemorate their favorite mutual sport. We constructed this weathervane in a combination of copper and brass. We also offer it with optional nickel silver and/or palladium or gold leaf. Adding contrasting metals increases visual interest as the weathervane moves through the patina process. If you look closely at the fletching beneath the rear wheels, you will see that we have added five ‘lucky’ pennies to this weathervane; one for each family member’s birth year. This is based on a tradition that originated during the Victorian Age and that we have carried forward. This family plans to keep and hand this weathervane down from generation to generation and those pennies will always be a part of its lore. Our Bicycle Weathervanes look beautiful silhouetted against the skyline but because there is a lot of open air inherent in this design, the fletching serves a practical as well as decorative function, serving as the wind catcher. Without it, there would not be enough metal face to make it turn correctly in the wind. 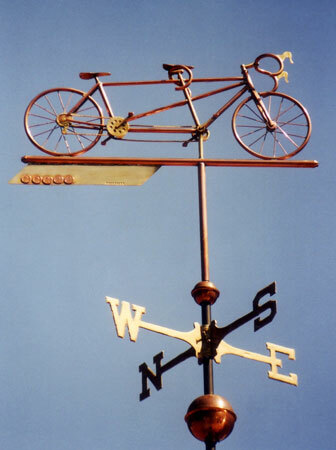 If you have a particular type of tandem bike in mind, we are often able to reduce the design fee for some of our more mechanical weathervane commissions if detailed schematic drawings are available. Detailed photos showing the bike from different vantage points are also helpful. We have discussed transforming this design into a portrait weathervane with several customers. If you send us profile views of the bicyclists, we could use them as the models and add them to the sculpture piece for a completely unique and one of a kind weathervane. We would be happy to discuss this option and pricing with you.